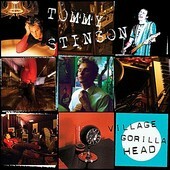 Former bass player for legendary and influential post-punk outfit The Replacements (and current bass player for Guns 'n' Roses), Tommy Stinson's 25-year music career comes full circle with the recent release of his debut solo record, Village Gorilla Head. Eleven tracks of power-pop, rock, and introspective singer-songwriter acoustics, Stinson blends every element of what he is known for in one nice package. And though he never will be Paul Westerberg in the lyrical department, the one thing that bogs Stinson's record down, only allowing the record the status of good and not great, Stinson isn't half bad. Album opener "Without A View" quickly proves Stinson's fearless ability to create delicate, harmonious melodies without forgoing his rocker heritage. And though "Without A View" is more on the pop side of spectrum than rock, it has a steady enough of a beat and enough of a snarl from Stinson and his vocals to keep the song on the edge. It is "Not A Moment Too Soon", the next track, that ups the ante, keeping things equally harmonious and melodic, though this time giving the song a guitar-rock bite and much more energy and drive. The outcome is a loud and proud power-pop-meets-post-punk anthem that comes close to a Westerberg-ian with the line, "You're holding on to dear life, but you're not holding on to me", evoking emotions of a failing relationship. Stinson later proclaims, in the chorus, "we fall apart, we fall together. We're getting worse, we're getting better," trying to turn a phrase like Westerberg, but not coming close. Though his voice believes in the words and the statement, giving it that open, ripe wound feel that had you latching on to Westerberg's songs. And thus making Stinson, at least for the moment, equally poetic and compelling. "Couldn't Wait" is another song where Stinson comes close to pulling off a genuine Westerberg phrase twist, screaming, "I couldn't wait to miss you" before later stating, "I couldn't wait to kiss you". A fast, driven, punk-inspired rocker, Stinson's roots are undeniably in full effect here, making it one of the album's most relished cuts. "OK" offers up the two sides to Tommy Stinson in one song. Opening with light percussion and acoustic guitar, Stinson's early morning, blurry-eyed voice floating on top of a pretty melody, before the chorus hits and the rock comes into effect. The song transforms back to a tender pop song, Stinson's vocals without remorse, and reserved, giving the song a sharp edge. The sweet spot to the song is the children's choir singing "It's OK" during the chorus, giving another dimension to Stinson's already versatile creation. Stinson is most versatile, however, on the title track, a lounge-laden dance track that finds Stinson stretching his wings and really going out on a limb, to sparkling results, creating a stylish, soothing pop song that provides the perfect late-night dance groove for the drunk and lonely. "Light of the Day" is all singer-songwriter, Stinson's acoustic guitar starting off the song before the full band kicks in. But when the full band kicks in and gives the song a good rock push, somehow Stinson still manages to keep the song on the softer side. Giving him an introspective piece that proves he's not all rocker, and can carry himself well when he's not hammering on his guitar. Even softer, and more singer-songwriter, the folk-infused "Hey You" finds Stinson delivering a danceable groove inside this tender pop nugget. Here is a songwriter that is comfortable regardless of the situation and just enjoys making music and getting his thoughts off his chest, making his sometimes watered down lyrical sense not matter as his passion and sincerity in his words carry him through. It is unfair to constantly compare Stinson to Westerberg. And though it may be unfair, it does not stop myself (or anyone else) from doing it. However, with Village Gorilla Head, Stinson has put out something better than anything Westerberg has done in the last decade, all while forging his own path and proving he can easily stand on his own. It's a good record, Village Gorilla Head. Despite its flaws, which are only glaring because of Stinson's impressive resume, its a solid pop record through and through and will make 'Mats and Stinson fans in general very happy. I'll give it a B+.